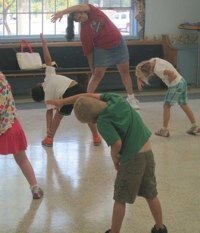 Every Thursday and Friday, our Gym Teacher, Mrs. Kolb prepares gross motor activities for each of our age groups. The children enjoy a 15-minute class, which begins with a warm-up song. They move their muscles, twist their torsos, and touch their toes to music. Mrs. Kolb teaches the children basic, beginner sports skills like kicking, bouncing, throwing, and catching a ball. They also learn how to jump, hop, skip, and gallop. It’s always a fun time when the rainbow parachute makes an appearance and the children use teamwork to toss leaves, balls, and even hide underneath. Most of the time, Gym class is held in Fellowship Hall, but every once in a while it’s held outside, too. In the Fall, they rake leaves into piles and jump into them and in the Spring, they do an Easter egg hunt. Twice a year, an obstacle course is set-up so the children get to enjoy showing off their abilities while the teachers assess their gross motor skills. Mrs. Kolb makes Gym FUN!